Back in December, I posted an overview of the XtremeMac FS1 High Definition Earphones and the Griffin TuneBuds. For my testing, I removed both items from their packaging and plugged them into three different iPods. I also had three other people blind test both sets of earphones, right out of the package. My conclusion was that the Griffin earbuds sounded good for $20, but I was disappointed with the $149 XtremeMac FS1 earphones. I received a few notes about my review. I listened to what the company reps had to say and agreed to revisit the FS1 earphones. This time I skipped the silicon sleeves altogether and tested with the foam sleeves only. I paid particular attention to using the right size sleeves so I had a perfect seal. This did change the quality of the sound considerably. I still had impressive audio at low volume -- something that the FS1s do better than any other earphone I've listened to (and that I praised in the original review even with the silicon sleeves). But the bass response improved dramatically with the foam sleeves -- much better than previously tested with the silicon sleeves. Overall, the FS1s are different earphones with the foam inserts. If you buy a set, they will come out of the package as shown here with the silicon inserts. My recommendation is to toss the silicon sleeves and use the appropriate size foam sleeves. This adjustment makes a tremendous difference in the earphones' performance... so much so, I wonder why the manufacturer includes the silicon sleeves in the first place. 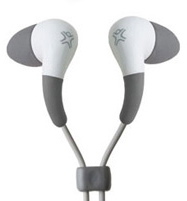 So back to my original question... are the XtremeMac FS1 High Definition Earphones worth $149? I think for some listeners they are. Of all the different people I've talked to about these earphones, the ones who praise them the highest are those who say they are in the music business, usually as sound engineers. Non-pros seem more divided about the value of the FS1s, mainly because of the price and that the foam sleeves are a bit of a visual turn-off for everyday listeners. They're not totally comfortable either, that is if you fit them correctly to get the best sound. My guess is that if you're picky about your audio, you will like the FS1s with the foam and not care about how they look. One other note: the fact that you can enjoy your music at lower levels with these earphones is a big deal, and worth consideration alone.